Welcome to the official website for the International Board of Hypnotherapy. The International Board of Hypnotherapy has set rigorous requirements for certification so that consumers, health and counseling agencies, clinics and hospitals can rest assured they are getting a qualified practitioner when employing an IBH Fellow. Physician to Physician Consultation on the benefits and strategies for the use of medical hypnotherapy as an adjunct to medical treatment and general patient care. Provide a registry of Medical Support Hypnotherapists for placement with Physicians, Nurse Practitioners, Midwives, Hospitals and Medical Clinics. Education for medical personnel and hypnotherapists in medical hypnotherapy methods. 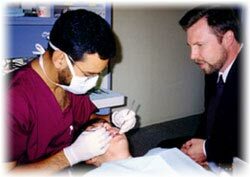 Hypnotherapist assists patient with anxiety and pain associated with dental procedure. Support and Conduct Research in the application and efficacy of hypnosis and hypnotherapy. What is the International Board of Hypnotherapy? As an ever-increasing body of research lends greater scientific credence to the use of hypnosis and hypnotherapy to assist patients in accelerating their healing, controlling pain and facilitating recovery from medical procedures, more and more patients and medical professionals are looking for ways to incorporate these benefits into the health plans they are designing. Yet, with no governmental oversight and a broad variance in training, a caveat emptor approach to a field that has long been misrepresented by the media makes hypnotherapy seem unapproachable to many patients and healthcare providers. IBH exists to regulate and maintain a demonstrated level of professional training, ability, reliability and ethics in the hypnotherapy community, so that healthcare providers and their patients can make use of the power of the subconscious mind with the guidance of competent professionals who know how to work with the healthcare system.